Malcolm Cooper, third from right, with a delegation of Aboriginal representatives who met with Prime Minister Robert Menzies in 1963. Malcolm Cooper, born in Alice Springs in the 1930s who grew up at St Francis House, met and lobbied Prime Minister Sir Robert Menzies in 1963 in Canberra as part of a delegation to promote justice for Aboriginal people. He was the inaugural president of the SA Aborigines’ Progress Association in the 1960s and was the first Indigenous person to play for the Port Adelaide Football Club. Malcolm Cooper was one of the original six boys to depart from Alice Springs in 1945 for Adelaide with his mother’s consent to live at St Francis’ House run by Father Percy Smith and his wife Isabel. 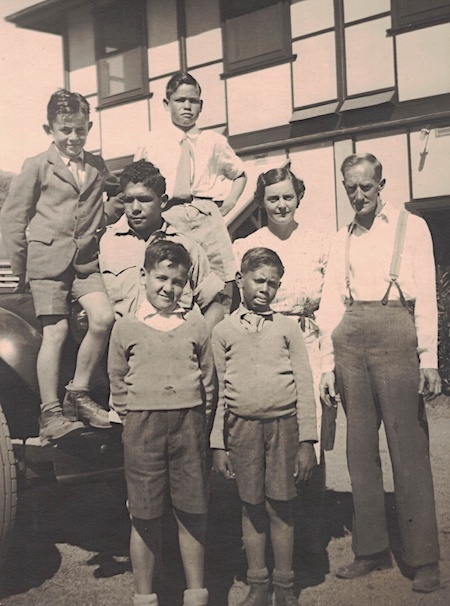 AT RIGHT: Group of boys ready in Alice Springs in 1944 – Bill Espie, John Palmer (Back), Noel Hampton, Charles Perkins, Malcolm Cooper (standing in front of Mrs Smith), Mrs Isabel Smith, Father Percy Smith. Malcolm Cooper’s mother, Dido Cooper, was at the railway station with the other mothers crying as the boys left. Malcom did well at school and initially went to Woodville High School and then Le Fevre Boys Technical School at Semaphore during the long period when Fred Vickery was headmaster, from 1943 to 1969. Mr Vickery was an accomplished sportsman and was an enduring support for the St Francis’ House boys. Vickery encouraged student participation in all sports and mentored a number of St Francis boys giving them a chance to play for the Port Adelaide Football Club. Malcolm was one of those boys. He excelled at Aussie Rules for Port, playing many games with the great Fos Williams during the club’s era of dominance. This included six premierships in succession in the 1950s. 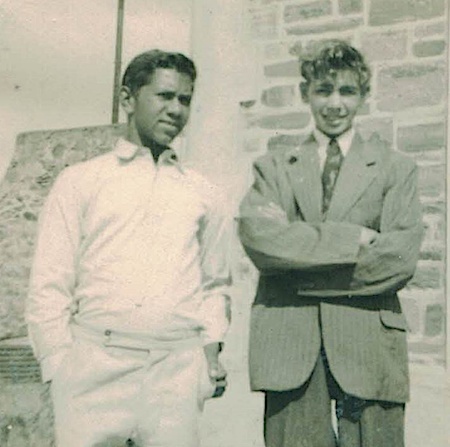 A half-back flanker, Malcolm was also the first Aboriginal footballer to play for Port Adelaide in a Grand Final, the seven-point loss to West Torrens in 1953. After completing school Malcolm became qualified as an electrician in the public service and worked at the Imperial Chemical Industry depot at Osborne in Port Adelaide. Later he became officer in charge of Aboriginal employment for the South Australian government. His wife Aileen was a Colebrook Home girl from Pitja Pitja country and had worked as a cook and domestic at St Francis’ House where she met her husband. In addition to sporting talent Malcolm and his St Francis House peers made significant contributions to the struggle for justice for Aboriginal people. In the 1960s Malcolm and wife Aileen worked with John Moriarty, white businessman Laurie Bryan, Winnie Branson, her brother Vincent Copley and others to establish the Aborigines Progress Association (APA) in South Australia, which became a hub for Aboriginal activists at that time. Malcolm was the first APA President in 1964. In the formative days regular APA meetings were held at 5 Talbot Street at Angle Park in suburban Adelaide, the home of Malcolm and Aileen Cooper. PHOTO: Malcolm in the middle. 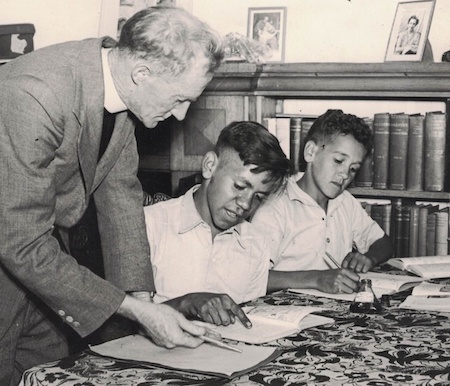 Father Percy Smith assists Malcolm Cooper and Charles Perkins with their homework at St Francis House in 1947. The APA became an effective political and advocacy organization. Membership grew to include included Aileen’s sister Nancy Barnes (nee Brumby) together with Aboriginal people Geoff Barnes, and Maude and George Tongerie. The organisation moved to a temporary government home at Taperoo near Port Adelaide. Aileen had a number of sisters and Aboriginal women friends while Malcolm had the backing of Aboriginal men friends: some of whom were boys from St Francis House, including Gordon Briscoe, Charlie Perkins, Jerry Hill, David Woodford, Harry Russell, Tim Campbell, Ken Hampton and Wilfred Huddleston, all of whom became APA members. The APA focussed on education and an Aboriginal Education Foundation was formed, which helped secondary and tertiary students and supported people such as Lois O’Donoghue, Margaret Lawrie and Maude Tongerie who were becoming politically active. 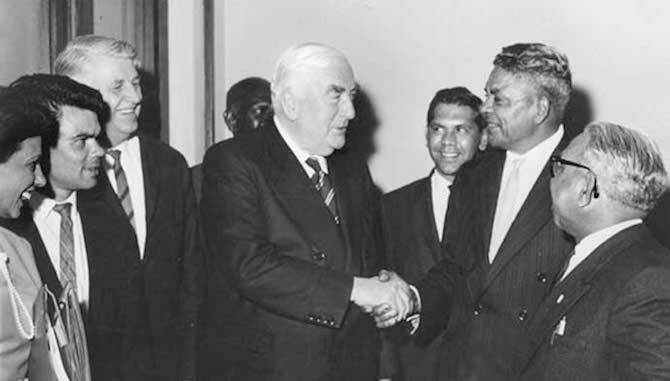 Such was the growing profile of Malcolm and the APA, he was invited to join a delegation that met with Sir Robert Menzies in September 1963 to inform the Prime Minister of the living conditions experienced by Aboriginal people in each state. It was the first time an Australian Prime Minister had received a deputation of Aboriginal people. There were seven people in the Federal Council for Aboriginal Advancement (FCAA) delegation. They were Sir Doug Nicholls from Victoria, Kath Walker and Joe McGinness from Queensland, Faith Bandler from New South Wales, Phillip Roberts from Darwin, Ted Penny from Western Australia and Malcolm Cooper from South Australia. Labor Member of Parliament Gordon Byrant was also at the meeting. From 1957 until his appointment as the first Minister for Aboriginal Affairs in 1972, Bryant was an office-bearer in the Aborigines Advancement League and the FCAA. Bryant had previously made a personal approach to the Prime Minister on behalf of the deputation and was at Parliament House to introduce the group. It was a turning point in Aboriginal affairs. Doug Nichols recalled in his biography that the group was confident, but nervous too. They realised it was a historic occasion. They were not just walking around street corners holding up placards. They were talking to the Prime Minister of Australia, but Nichols didn’t doubt that Sir Robert was nervous too. The delegation put several matters before the Prime Minister. Firstly, it was seeking a referendum on two sections of the Australian Constitution, which discriminated against Aboriginal people: Section 51 and Section 127. Section 51 gave the Federal Government power to frame laws for “people of any race other than the Aboriginal race in any State for whom it is deemed necessary to make such laws”. This section was not originally intended to discriminate against Aboriginal people, but rather to enable the government to deal with such immigrant groups as the Kanakas and Chinese. However, the section working in reverse, specifically excluded Aboriginal people from beneficial Commonwealth laws. Section 127 said: “In reckoning the numbers of people of the Commonwealth, or of a State or other part of the Commonwealth, Aboriginal natives shall not be counted.” It was particularly discriminatory. The deputation also asked for the abolition of State Acts governing Aboriginal people, and for all Aboriginal people to be brought under one Commonwealth law. They also pressed the claim for bauxite royalties for the people or Yirrkala, 18 kilometres south of Nhulunbuy in Arnhem Land. They asked about the role for Aboriginal people in the new program for “developing the North” given the majority of Aboriginal people lived in the northern areas of Western Australia, Queensland and the Northern Territory. Skilled labour would be required to realise the economic potential of the north and the deputation asked that Aboriginal people, as a permanent on-the-spot labour force, in contrast to the white workers who drift in and out of the territory, be trained in skills to suit the emerging development. For the first time Aboriginal people were putting their own views to the highest authority in the nation and they made the most of the opportunity. Ted Penny talked about white people not being allowed to visit Aboriginal reserves, not even a white man with an Aboriginal wife. The policy of the FCAA was to boost the morale of Aboriginal people by encouraging them to speak for themselves, to realise that no white voice could be as effective as their own. The delegation spoke about the desire of Aboriginal people for equality and acceptance. “We ask for equality in all things: education, living standards, opportunity – nothing more, nothing less,” Sir Doug told the Prime Minister. PHOTO: Malcolm Cooper (Coop) and Peter Tilmouth (Truck) at St Francis House in 1952. At the end of the meeting Menzies said how impressed he was with the way they had conducted their case and expressed their views. He said, honestly, that he had not thought they could do it, especially to have mustered such a large, strong group. Menzies agreed that the government would pay the five hundred pounds to cover the cost of airfares and promised to give earnest consideration to the proposal for a referendum. There he was enjoying a glass of whisky with the Prime Minister yet he wasn’t recognised as a citizen in his own land. Neither could he express his personal view, to either vote for the Menzies Government or against it. A FCAA report of this meeting says that the Prime Minister “appeared to be hearing many of these facts for the first time and undertook to enquire further into the situation, particularly with regard to the appeal for a referendum to delete the discriminating sections in the Commonwealth Constitution”. Malcolm became the South Australian state secretary of the FCAA in 1965 and continued to build on this work to push for the successful 1967 referendum called by the Holt Government, which approved the two constitutional amendments. Most referendums fail, but these amendments were overwhelmingly endorsed, winning 90.77% of votes cast and carrying in all six states. Aboriginal people would now be counted in the census and have equal rights, at least in law. Tragically Malcolm died at a young age. John Moriarty was one of the many inspired by Malcolm’s achievements who picked up the baton to fight for justice for Aboriginal people. John reflected on Malcom’s potential and in a 1996 interview said: “People like Malcolm Cooper, who died very young in my view with a brain haemorrhage, while he was in Tennant Creek, he was flown up to Darwin, you know, he died before he got to Darwin, had a great deal of potential too to go on. “Oh I think he was in his twenties or thirties, early, maybe early thirties. But Malcolm had a lot going for him too, and he was a good footballer. He played for Port Adelaide. But St Francis House was an exceptional home. If you look at the situation today and look back in retrospect,” Moriarty said. Malcolm was a key part of that initial penetration into the Prime Minister’s ear in 1963, which helped to pave the way for this his peers to take up the charge in his absence. Thanks for this story Mark. Looking forward to more in this series. l am very much enjoying these articles. My partner was Bill Espie. He is in the photo with Father Smith and Mrs Smith at the side of the house. Charlie and three others – Malcolm, Vince? And maybe Ernie? I remember Bill telling me about Malcolm dying on the plane. He was in his early 30s, from memory. Then Peter Tillmouth died also young in a mine at Andamooka. I still have the papers they sent Bill when they finally managed to bring his remains home. My Bill lived till the early 70s. He retired as the highest ranked comissioned officer of Aboriginal descent in the whole of the Australian police forces. He was also recipient of many awards for excellence to duty and was awarded by the Queen and written up in the London Gazette.